To bring our site to life, our Machine Parts Section remains under construction and therefore, we apologize for any inconvenience. With thousands of embroidery machine parts in stock, we have selected the most requested and frequently purchased mechanical and electrical components we supply to the embroidery industry. 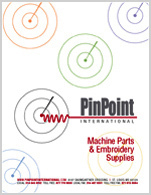 This is only a small representation of the vast inventory of embroidery machine parts PinPoint International stocks or have available through our global partners. Our long-time customers know our commitment to providing support with identifying machine parts and providing solutions for those hard to find and discontinued parts. We always welcome our customers to contact our office at 877-778-9850 and speak with our expert and experienced sales associates.